Considered a medical emergency, heatstroke results from excessive exposure to the sun. The condition occurs when your body temperature rises to 104 degrees Fahrenheit or higher and can lead to organ failure, brain damage, and even death. 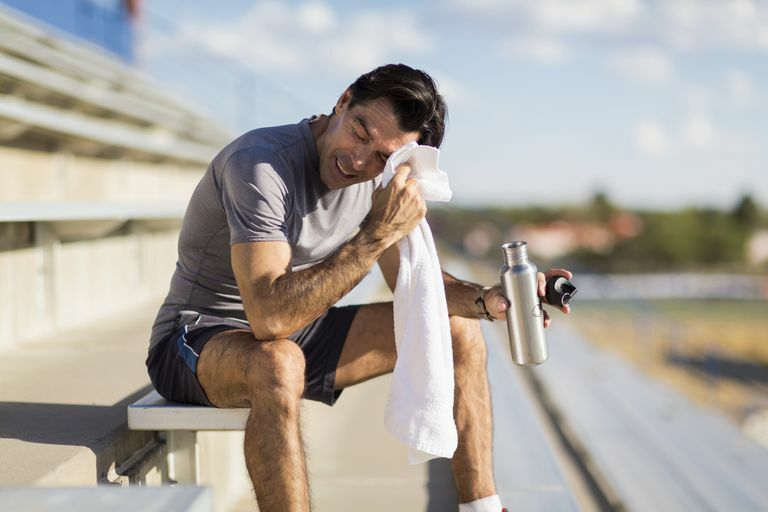 In incidences of heatstroke, the body isn't able to produce enough sweat to keep its temperature in check. Typically brought on by vigorous physical activity and high environmental temperatures, heatstroke arises very quickly and calls for immediate medical attention. If you show any signs of heatstroke, it's crucial to seek immediate medical treatment. While awaiting treatment, stay in a cool environment (such as the shade or an air-conditioned room), cool down by covering yourself with damp sheets or spraying your body with cold water (preferably while resting in front of a fan), and drink plenty of water. Since heatstroke is partially caused by a depletion of salt, rehydrating with salt-containing sports drinks also may be helpful. Avoiding strenuous activity in hot weather is one of the best ways to prevent heatstroke. If you do decide to engage in intense activity when the temperature is high, try to take frequent breaks and drink lots of fluids. Loading up on fruits and vegetables on hot days may also help stave off heat stroke since the plants provide a beneficial balance of water and salt. You should also avoid alcohol and caffeine, both of which are known to promote dehydration. Although they won't protect you from heatstroke, certain essential oils can help you feel cool on sweltering summer days. Try blending one drop of peppermint essential oil, five drops of lavender essential oil, and one cup of distilled water. Store the mixture in a spray bottle in your fridge, and spritz it onto your arms and legs whenever you need a quick cool-down. Peppermint oil contains menthol, a compound that induces a cooling sensation by activating certain receptors in the skin. Mahieu F, Owsianik G, Verbert L, Janssens A, De Smedt H, Nilius B, Voets T. "TRPM8-independent menthol-induced Ca2+ release from endoplasmic reticulum and Golgi." The Journal of Biological Chemistry 2007 2;282(5):3325-36.